Subtitled: The Strange Death of World War 11’s Most Audacious General. Bill O’Reilly is the host of a popular conservative television show in the United States and the author of several books based on history. In this book, O’Reilly tells the story of a very popular American General during World War 11, leading the U.S. Third Army through North Africa and Europe. Although Patton is well liked by the fighting men of his Army, he is not popular with the Allied Supreme Commander General Eisenhower, the Russian dictator Joseph Stalin or President Harry Truman, mainly because he says what he wants to say, whether the brass likes it or not. Patton sees the war in Germany coming to an end and he wants to keep going east and push the Russians out of Eastern Europe. He sees the communists led by Stalin as a threat to Eastern Europe and the free world. Winston Churchill doesn’t trust the Soviets either, but the U.S.A and Stalin have already drawn up plans to split up Europe for the victors after the war ends. Joseph Stalin wants Patton assassinated and Truman and Eisenhower want him out of Europe, after the war ends. The book starts with Patton dying in a U.S. Army hospital in Heidelberg, Germany on December 21, 1945. The two Generals are on their way to a hunting trip in the German countryside. They are following an American Army sergeant in a jeep, carrying their hunting rifles. Patton is paralyzed with a broken neck. His scalp has been torn open from being thrown from his seat and his nose is broken. The other General and the driver aren’t injured and neither are the three people in the truck. Only the driver of the truck is identified. One of the passengers may be a German national riding in the truck in violation of U.S. Army orders. The U.S. Army Military Police do not do a very good job in their investigation and the accident report. The driver is not reprimanded, even though he did not have permission to use the truck. There is no indication that anyone other than the hunting party knew the intended route of the hunting trip. 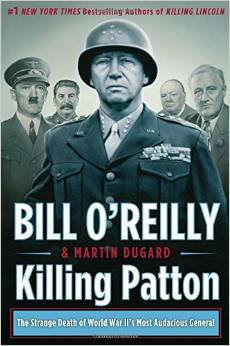 O’Reilly writes that the Russian NKVD, the security force in charge of assassinations and espionage had been under orders by Stalin to assassinate Patton. O’Reilly also suggests that a shady American OSS Agent, a former U.S. Marine named Douglas Bazata was instructed by Wild Bill Donovan the head of the American OSS to kill Patton as well, probably because Donovan was a Stalin sympathizer according to O’Reilly. In 1979, at a reunion of former OSS Agents in Washington, D.C. Bazata told the crowd of four hundred and fifty former agents that he was at the scene of the accident involving Patton and the truck, and that he had fired a low velocity projectile into Patton’s neck, breaking the Generals neck. There is no mention of any follow up investigation about Bazata’s claim by any military or law enforcement agencies. O’Reilly does state that a fiction book was written by a British author named Frederick Nolan titled the Algonquin Project. This book was published in 1974. In the Algonquin Project, an assassin creeps up to Patton’s Cadillac at the time of the car crash and fires a low-velocity projectile into the General’s neck breaking it. Bazata had claimed that he told a newspaper reporter and two former OSS agents about the assassination in 1972, two years before Nolan’s book was released. The book is a well written account of the United States military history in the war in Europe and I found it to be an interesting read. I do not think that O’Reilly made a good argument for the assassination of Patton. Based on his description of the accident, I tend to think that General Patton was killed in a vehicle accident that was not properly investigated, but that would be up to other people to determine.